The European Commission financed i3 project, supported four Competition winners to attend the NAB Show in Las Vegas 2018. The prize enabled winning teams to find new connections and commercial opportunities. The seven-day event included conferences, educational programmes, exhibitions and one-off events where winning technologies showcased their innovations and networked, met with corporates, potential partners, like minded founders and technologists, with the aim of boosting their businesses and seeking opportunities to commercialize their products. This event was ideal for the i3’s NAB Competition winners as it offered startups and projects the opportunity to meet with a diverse range of media stakeholders on an international scale. There were also opportunities to set up one-to-one meetings with key stakeholders, attend small network events and get coaching and mentoring in the educational programmes. 2 European startups and 2 European projects with ICT-19 support actions won prizes. The prize was access to NAB Exhibits, Show Opening, All-Badge Access Sessions and choice of 6 Sessions from the Conference Program as well has hotel and travel fees. The winning technologies were from London, Barcelona, Madrid and Poland. Vimojo (Startup). User-Generated Content enabling Mobile Journalism. IsnotTV (Startup). Video content consumption technology for content publishers. COGNITUS (ICT-19 project). User-Generated Content ready for broadcasting. Immersify (ICT-19 project). Video codecs ready for next-generation 8K and 16K screens. The i3 competition sought to offer European technologies in the convergence of broadcasting, broadband and social media areas opportunity to access markets and commercialization opportunities that they would not easily access on their own. The representatives from each winning technology enjoyed a full 7 days programme. The winning technologies each planned their agendas and pre-arranged meetings with key contacts and pre-arranged opportunities to demo. Startups focused on making connections and sales to key media stakeholders. Winning projects focused on new technologies to partner with and improve their products. 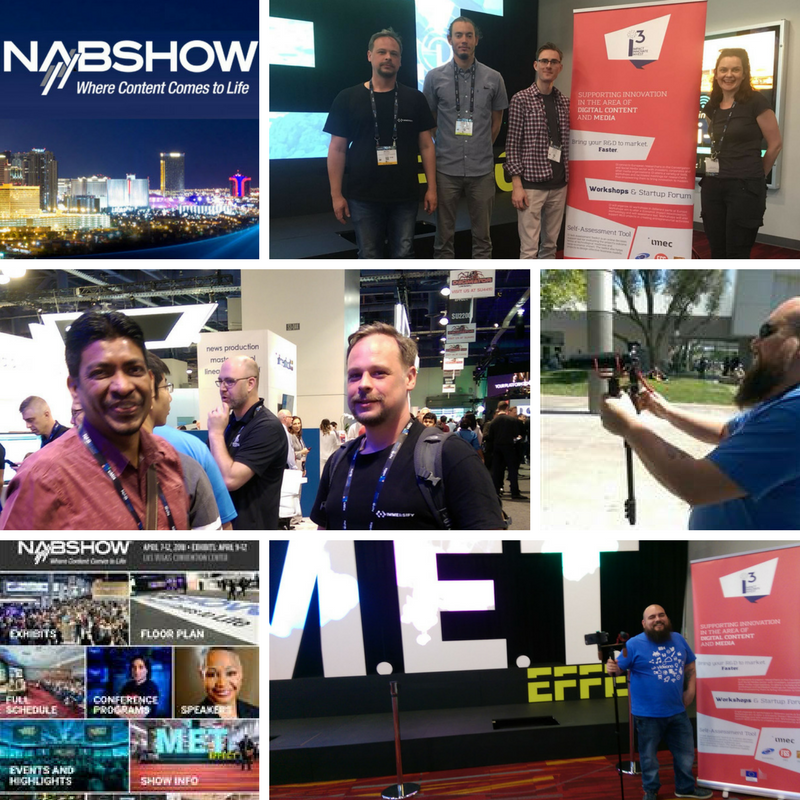 This year’s NAB show was certainly a success, with more than 100,000 attendees from 161 countries and 1,800+ exhibitors across the three main halls. The meetings and connections made by the winning technologies are all really encouraging, with a few key, big commercial discussions and exciting opportunities in the pipeline. We look forward to the brokering of some beneficial commercial contracts and hope these will result in long-term business partnerships for the winning technologies. The competition was a huge success offering real opportunities to the European technologies that they could not readily or easily create on their own. The i3 project offered monetary opportunities not easily afforded by developing technologies as well as assistance with organising commercial opportunities and support across the seven days of the NAB show.